The OneTouch Verio IQ is the new go-to glucose meter for anyone who wants a smart meter. It has a great memory and it virtually smarter than any other glucose meter out on the market today. The OneTouch Verio IQ is the first meter ever with Pattern Alert Technology. This technology shows you when your blood sugar has been too low or too high for a period of time. The meter shows color coded messages to show if your blood sugar level is too high (red-colored) or to low (blue-colored). It also sends out a message such as “Your blood sugar has been high around this time”. It also sends out alerts that will remind you of these patterns for the next 24 hours. That way, if you are busy doing something at that moment, it will remind you again later. Unlike many other glucose meters, this one has a color screen which is great for using it in the dark. That way you can use it on a road trip without the need of an attention grabbing light or in the middle of the night without worrying about using a lamp. It has a 750-test memory and can store up to 50 pattern messages. This will help you to see common threads in your results. There is no manual coding and there are four easy-to-use buttons the meter itself that you can use to navigate through the meter. The menu is easy-to-navigate and very friendly. The meter itself can store and display 7, 14, 30 or even 90 days worth of blood sugar averages. The One Touch Verio IQ requires very little blood for its test, about 0.4 uL, which is less than many other glucose meters on the market today. The testing strip is gold in color, which is different from other meters and can be tested on either side which means you don’t have to worry about sliding it in wrong. The lancet has been called easy-to-use and comfortable because the prick is painless and since not much blood is used, the needle doesn’t need to go very far in. It is fluent in Spanish, which is great because that means it versatile. It is rechargeable, through rechargeable battery and only needs to be charged about twice a month. All you have to do is plug it up to your USB cable or AC adapter, which are included. It will start charging and you can still keep tabs on your patterns. This entry was posted in Glucose Meters on August 7, 2012 by admin. Seems like everything is going wireless including medical devices and that doesn’t excludes diabetes devices such as the One-Touch Ping. The One-Touch Ping is a great new diabetes insulin pump that is making great headlines and receiving top-notch reviews across the web. It is an intelligent glucose management system that allows diabetics to receive multiple daily injections and gives the ability to quickly adjust insulin, completely based on what the body needs at the very moment. One-Touch Ping uses both a pump and a meter-remote. The meter-remote can control the pump from a distance so that the pump can be left where it is on the body. 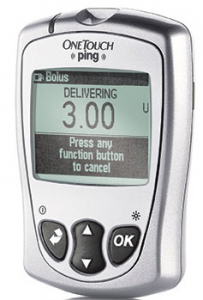 Many complaints about insulin pumps are that they always have to be taken off to adjust and so on, but with One-Touch Ping, the pump doesn’t have to leave the place it has been set. Instead, everything can be done through the meter-remote, which makes an insulin pump less conspicuous which is another complaint, made by many insulin pump users. However, the pump can be used manually as well without the meter-remote. The meter-remote has a full set of functions that are designed to help a diabetic manage their diabetes more discreetly, which means it’s perfect for an on-the-go lifestyle. The meter-remote even allows you to dose your insulin needs from it, which is extremely helpful when a person is pressed for time. The One-Touch Ping has a very sleek design to it and with an impressive belt clip and a curved inner side, it can be easy to hide away. Software programs that are compatible with both Vista and Mac make managing diabetes even easier since many different things can be downloaded straight to a PC or laptop such as details on bascal, bolus rates, averages and graphs. Music can even be uploaded to it like with a cell phone or MP3 player and both the devices can be hooked up through an easy-to-use USB port that only takes about five minutes to set-up. The screen is very easy-to-read and is even backlighted so that when using at night, no lights need to be turned on. The days of waking others in the house to manage your diabetes because of bright lamps is over with the One-Touch Ping. It has a small bascal range; insulin can be delivered in the lowest amount available of 0.025 u/hr. The meter-remote has a Calorie King function that allows the user to program up to 500 foods and their nutritional values in it. If there are any issues with the device or questions about how to use it the makers of the device, Animas, have a great support system that is open 24/7, 365 days and will allow a message to be left and a callback time of no longer than 10 minutes. You can easily upgrade your old Animas device to a Ping through the ezAccess program and all you have to do is pay the difference between the two devices. The One-Touch Ping is easy-to-use and easy to hideaway which makes managing diabetes less of a hassle so that there is more time for fun in life. This entry was posted in Glucose Meters on August 31, 2011 by admin. Bayer Didget Meter For Kids: Children get diabetes just like adults. In fact, studies suggest that more children are developing diabetes a lot earlier on. According to the American Diabetes Association, about 215,000 children and adolescents under that age of 20 have either type 1 or type 2 diabetes and one in every four hundred children have type 1 diabetes. Having diabetes at any age can be difficult but even more so as a child. Many children don’t want to brush their teeth or take a bath so when it comes to getting pricked by a needle it can almost become impossible to endure. However, thanks to a new meter designed for children, testing couldn’t be more fun. The Bayer Didget Meter For Kids is a nice addition to any child who has diabetes because it can make testing fun. 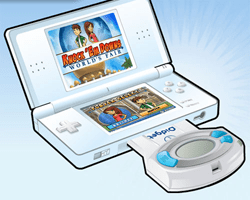 It actually rewards a child for testing regularly through free games on their Nintendo DS or Nintendo DS Lite. It is the only blood glucose monitor that plugs directly into the gaming system. The Bayer Didget Meter For Kids is great for any children who had diabetes because what better way to get your child to test consistently than to offer a reward? It’s a perfect piece of technology and children are already falling in love with and can’t wait to test again. The monitor itself has two modes. The Bayer Didget Meter For Kids can be a wonderful addition to help your child to remember that they need to test. While it does add the “fun” bonus of being able to earn rewards, it also helps your children when their fight against diabetes. By checking their glucose regularly, they can’t help fight off any diabetic complications that might arise in the future. It is a win, win situation. This entry was posted in Glucose Meters on July 29, 2011 by admin. Bayer A1C Now Self-Check System: If you have diabetes then you have to check your blood glucose quite regularly and there is no better way to check it accurately and regularly than to have an updated blood glucose monitor. There are a lot of issues with out-dated blood glucose monitors and one of those issues is irregular readings. If you monitor is old, it may give off readings that just don’t sound right and you may actually be making your diabetes much worse. Another major concern to those using glucose monitors is the pain that they feel with each prick to measure their levels. It can actually be quite painful when you have to test 3-4 times a day. The last issue that many people face when it comes to their monitor is the fact that it becomes more of a hassle to use than other glucose monitors today. You have change out lancets every time you test, you have to clean up the monitor itself, not to mention the fact that you have to place the testing strip into that tiny opening in the monitor. It all becomes a huge hassle that many people tire from quickly. You also must write down each and every reading and many people tend to forget that part. With the Bayer A1C Now Self-Check System, all the problems are thrown to the wayside. You are getting one of the most highly advanced monitors on the market and what can be better than that? First off, this monitor measures your A1C level which is very important when looking at diabetes. A1C measures your average blood glucose level over the past 2-3 months, which is said to be very important and is recommended by the ADA (American Diabetes Association) to be below 7 percent. However, this monitor is not for daily use, it is used to look at the big picture when it comes to measuring diabetes as a whole but is still very effective. Bayer A1C Now Self-Check System kit includes: 1 A1C Now Self-Check Monitor, 2 single cartridges, 2 shaker kits, 1 quick reference guide, 1 overview and helpful hints booklet, 1 instructional DVD and 1 extra lancet. The Bayer A1C Now Self-Check System is a great monitor that will monitor your A1C level and that’s important because with even as much as 1 percent reduction, many issues and complications that diabetic patients face can be lowered. Measuring your blood sugar level as a diabetic is very important and many cannot always measures theirs as much as they would like but with more advanced products coming out all the times, everyone is sure to be able to get an accurate reading so that diabetic complications are no more of an issue. This entry was posted in Glucose Meters on July 28, 2011 by admin. 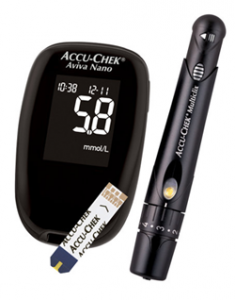 Accu-Chek Aviva Nano: Monitoring your blood sugar levels is very important and when a diabetic patient is unable to check their blood sugar, it can cause some other health issues such as retinopathy or neuropathy. While it is best for diabetic patients to check their blood sugar regularly, some patients cannot because their blood sugar monitor does not provide enough stability to take regular, accurate readings. While this is one of the most common complaints among diabetic patients when they talk about their blood glucose monitors, there are other complaints. For example, many people complain about painful pricks and slow readings. Thanks to newer technology however, these complaints are becoming obsolete. The Accu-Chek Aviva Nano is a glucose monitor that is helping to take the pain out of pricking, is easy to use and also gives fast results. So far many diabetic have started using this glucose monitor and have very much liked what they’ve seen. 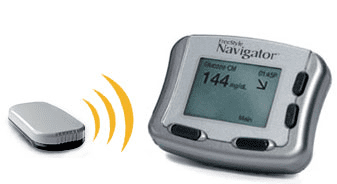 In fact, it is one the most popular glucose monitors on the market today. Let’s start addressing some of the complaints that many people have with their old glucose monitor to see just how awesome the Accu-Chek Aviva Nano is. Many patients complain that their glucose monitors are not very easy-to-use but the Accu-Check Aviva Nano is very easy to use. With many glucose monitors, the lancets cause a lot of gruff with individuals because they must be replaced every time an individual tests their blood sugar. However, with the Accu-Chek Aviva Nano, a simple device makes the lancet process much easier. A 6-needle drum fits into the applicator that supplies an individual enough needles to test through-out the day. While it is suggested to switch to a different needle every time an individual tests it is common for one needle to be used more than once. It also saves on money when buying products as well. Based on the easy-to-use lancet device, the pain issued through the prick is a lot less than other glucose meters. 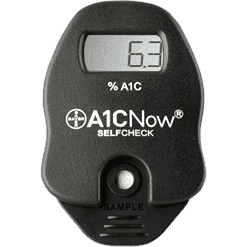 Memory-The Accu-Chek Aviva Nano can hold up to 500 results with time and date. Power- the Accu-Chek Aviva Nano runs on 2000-test 3-volt lithium coin cell battery capability. Chip- An insert-able chip helps to keep important information is stow and allows for information to be brought up quickly. The Nano comes with an understandable easy-to-use manual. Be sure to read the Accu-Chek Data Management Tools section, as it comes in handy the most. While there are so many great things to say about this awesome monitor, this wouldn’t be the best review if I didn’t mention some of the negative things. One negative issue that most people endure is that malfunctions that happen with both cold and hot temperatures. However, these are the same issues that happen with most electrical and battery-ran devices. At 8 degrees Celsius, the monitor will stop working and in high temperatures, the monitor will malfunction. However, that seems to be the only negative thing to say about the Accu-Chek Aviva Nano, everything else is positive. This entry was posted in Glucose Meters on July 27, 2011 by admin. Bayer Contour USB Glucose Meter: Throughout history, diabetes management has been a difficult process, mainly due to the monitors that record blood glucose results. Through time products have obtained a higher status and even made testing easier and less painful than before. However, it was not until Bayer’s revolutionary portable blood glucose monitor showed up in the medical market that things really began to change. That was nearly forty years ago that Bayer’s first portable blood glucose monitor hit the medical market. With every year, due to technical advances, medical machinery gets better and better. Thanks to Bayer, the future of healthy, fast and effective diabetes management is easier than ever due to the new Contour USB Meter. In today’s world, nearly everything can be completed on the computer. Due to the internet, much more can be done such paying your bills, doing some Christmas shopping and even in some areas do some grocery shopping. Now, with the Contour USB Meter, you can also keep your diabetes tests on your computer with simple and easy technology that comes with your monitor. The new Contour USB Meter has a plug and play feature which makes connecting to your computer fast and easy, even for those who are not quite as computer savvy as others. Easy GlucoFacts Deluxe Software makes the install simple and fast as well. 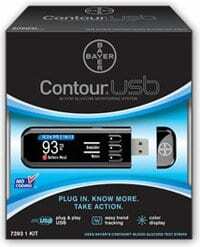 With the new Contour USB Meter, you can keep up with your diabetes management by setting up a reminder for yourself. In today’s world, it is easy to get lost in the fast paced rush of work, school and others events that keep us all busy. With the Contour USB Meter, you’ll get a reminder to let you know when it is time to test and thanks to the 2,000 storage capacity unit, you will always have your results handy. When you have more time available, make sure you use the insights that will help your doctor to understand how you were feeling when you took your blood sugar. You can mark your test results as “sick” or “stress”, you can add whatever you would like to describe the way you are feeling at the moment. The new Contour USB meter is a great adaptable, small portable blood sugar monitor that is perfect for the on-the-go lifestyle. This entry was posted in Glucose Meters on December 8, 2010 by admin. Most people who have been dealing with diabetes are often seeking and ready to welcome new tools that will help them to make managing their diabetes less painful, less of an inconvenience, and less of an intrusion into their daily lives. As anyone who has diabetes is well aware, dealing with all of these difficult factors can sometimes feel as if they are even more bothersome than the condition itself. The Accu-Chek Multiclix lancing device is a handy little tool which will end all of these concerns, and making managing one’s diabetes a much simpler task. There are a number of factors which lead to the superior nature of this device. One of the most important features, which every person who is dealing with diabetes management will surely appreciate, is that this device is adjustable, so it will feel almost as if it were tailor-made for each individual user. The eleven different settings are provided so that each person can adjust it to suit his or her own skin type. In addition to the adjustable nature of the device, its ease in use will make the Accu-Chek Multiclix device the ideal blood-testing tool for every diabetic, regardless of his or her age. 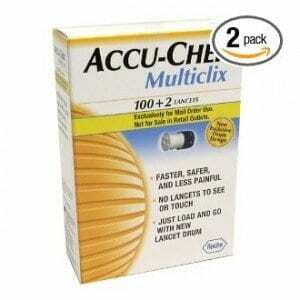 The Accu-Chek Multiclix device is very convenient, because it is completely portable. Everything that you will need to check your blood on a regular basis is self-contained within the device. It holds six lancets, so you will not have the bother of filling and refilling it throughout the day– all you need to do is pop the device into your pocket or purse, and you are ready for even your most active schedule. 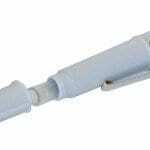 The lancets which you will receive with your Accu-Chek Multiclix device are tested for both safety and comfort. If you have ever dealt with regular needles which were not up to standard, you will appreciate the fine quality of these lancets as soon as you first use one. You will no longer have to experience pain from using inferior needles; and this product will eliminate the waste of money from inferior needles, as well as the concern of being caught away from home without a lancet that you need to check your blood when it is time to do so. When you elect to use the Accu-Chek Multiclix device, you will know that you will always have the superior-quality tool on hand when you need it. As anyone who has diabetes knows, it is a very serious condition. As such, monitoring your blood on a regular basis is absolutely essential in order to ensure blood glucose stability. If you have already spent many years attempting to manage your diabetes with the few methods which were all you could find until quite recently, you will surely be relieved when you try the Accu-Chek Multiclix. Not only is the precision of this product of the highest possible standards, it is designed to make managing your diabetes no more difficult than any other routine part of your everyday life. There are so many products currently on the market for diabetes management that selecting the equipment that is best for you can seem like an overwhelming task! This is why it is helpful to gain some basic information about the products which are available, so that you can make the most informed choices in which particular products you will find the most suitable. Gaining this information beforehand will also help to eliminate the chance of wasting money on products that you will not like, as well as the personal inconvenience of actually using such products. The BD Lancing Device is one tool for blood-sugar monitoring which you might like to consider. As is the case with any type of equipment there are both pro’s and con’s to this device, so knowing both the facts about the BD Lancet Device and the degree at which this product has been received by other diabetics who have already used it, should go a long way in assisting you in making a decision about whether or not this is something you would like to try. The fact of the matter is that people who have used the BD Lancet Device have found it to be less than satisfactory for a number of reasons. The main reasons cited for dissatisfaction with this product include that it is not as easy to use as one may hope when purchasing the device, and adjusting it can also be a bit more complicated than some other similar types of devices. After the initial adjustment, however, the device will be set and ready to use. Whether these factors figure in to your eventual decision about the BD Lancet Device or not, it is a good idea to also consider some of the more positive aspects of this tool. One important factor of the BD Lancet Device is that it is convenient. If having a blood-drawing device that is easily portable is one of your main priorities in finding just the right tool, this product will provide it for you. The adjustable feature of the BD Lancet Device also means that it will provide a more-than-adequate degree of comfort when drawing blood. This is a very important feature, for it will help each user feel as if it had been custom-made for him or her. If you have ever tried a blood-drawing method which operates on the “one-size-fits-all” notion, you are sure to appreciate this adjustable feature! The safety factor is a concern for most diabetics. When the lancets are handled properly, the BD Lancet Device will give you a much better than average degree of safety. This is especially significant when the person who will use this product is a child. With just a little instruction beforehand, even a child can learn how to use this device safely. Every product has both negative and positive qualities. All in all, the BD Lancet Device can be a good choice in blood-drawing products when used with reasonable care.